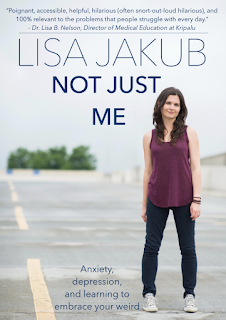 Lisa Jakub is the author of the new book Not Just Me: Anxiety, Depression, and Learning to Embrace Your Weird. 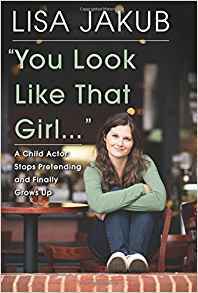 She also has written the memoir You Look Like That Girl: A Child Actor Stops Pretending and Finally Grows Up, and her work has appeared in publications including Newsweek and Today.com. As an actor, she appeared in various films including Mrs. Doubtfire and Independence Day. Q: Why did you decide to write this new book, and how did the process of writing it affect you, particularly in relation to your own issues with anxiety? A: For the last few years, I’ve been doing public speaking events at high schools and colleges. I talk a lot about authenticity and how to live a life that feels passionate and true, even when it might be different than what other people expect of you. I knew I wanted to write about anxiety, but I was definitely concerned. I wondered if diving into the topic of mental health was going to trigger my own issues and make me miserable. But learning about the science behind how our brains and emotions work was incredibly enlightening. And talking to others about how anxiety impacts their lives was so comforting. So many people are struggling silently, they feel like they are just weird and need to “get over it.” I felt like that for a long time, too, but being open about mental health issues, and getting help and support is what makes all the difference. There is no need for shame, and I hope that with Not Just Me, I’m doing something to help ditch the stigma around these common issues. Q: You write, “I have a new mantra these days: Embrace your weird. It has become my touchstone.” What does “embracing your weird” involve, and how has it helped you? A: Everyone has something about them that makes them feel like they’re weird and that they have to hide that from the world. For me, that was anxiety. But when I embraced the weirdness, life got much easier. When I accepted the fact that anxiety is just part of who I am, it became a much smaller part of who I am. It’s not about just becoming a doormat and letting anxiety run my life, it’s about understanding and working with the anxiety, so I can have more joy in my life, even in the midst of the chaos. I no longer have to constantly run away from myself and try to be someone I’m not. We’re all weird. We all have our issues. And when you chose to be brave enough to face the challenges, and drag them out from the shadows —you can do anything. Q: In the book, you wonder about the connections between your social anxiety and your acting career. Do you think acting contributed to your anxiety? A: I started acting when I was four years old, so it’s hard to tell what impact it had on shaping my personality. It is a job that demands perfection in various forms, so I wonder if that helped ingrain some difficult mental habits. But on the other hand, some of those anxious tendencies really are genetic. So, maybe my deeply sensitive nature helped me to be a better actor. Q: Did you need to do a lot of research to write this book, and did you learn anything that particularly surprised you? A: I loved doing the research for this book. I was so fascinated to hear the stories of so many different people and learn about how anxiety and/or depression showed up in their lives. I talked to combat Veterans with PTSD and cutters and 10-year-olds with debilitating perfectionism. I think what surprised me most was just how similar all the stories sounded. People who were in completely different circumstances all had similar fears — fears of not being good enough, of being “weird,” of being a disappointment or a failure. So many of us feel that we are lacking somehow. But from my perspective, I saw all these incredible, courageous, loving people. That wasn’t because of anything they accomplished, but it was just because they existed. A: I’m continuing to do talks at high schools, colleges, and mental health organizations. Despite the fact that I get really nervous before the events, I love talking to people about these important topics. 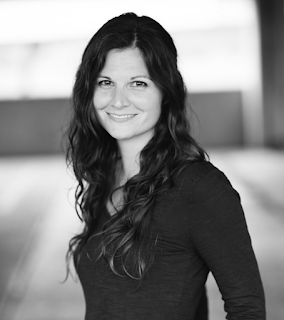 I also recently became a yoga teacher, and so I’m now leading yoga and writing retreats - specifically for folks who deal with anxiety. Both writing and yoga are powerful tools for working with anxiety and for creating more peace and joy. I love being able to share that in a more personal group setting. A: People can follow me at LisaJakub.net or through social media: Facebook, Twitter, Instagram. Not Just Me and my memoir, You Look Like That Girl, are available now, and signed/ personalized copies can be purchased here and here.